Kickstart Concepts launches Flymodo at Techcrunch Disrupt:NYC Hackathon. At the recent Techcrunch Disrupt:NYC conference, the Kickstart Concepts team built and presented Flymodo, a Twitter app for tracking flights in real-time. Flymodo was named one of the “Best TechCrunch Disrupt Hack Day Demos” by ZDNet. Flymodo allows people to use Twitter to “check-in” to a flight by simply tweeting a hashtag of their flight number. They can then see who else is on their flight and read tweets from other travelers. The site also provides information such as your gate number and baggage claim carousel, all from just one simple hashtag. 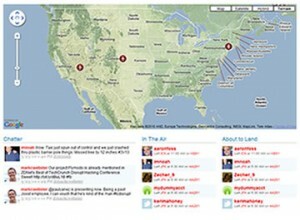 The entire site was built and designed from scratch at the conference’s hackathon in less than a day. This year Techcrunch launched their first Disrupt conference right here in New York City. The conference aimed to gather “both Web innovators disrupting media and technology and also executives successfully navigating disruption to talk about turning change into opportunity.” In the spirit of disruption, they also included a hackathon as part of the agenda. For those that don’t know, a hackathon is where programmers and designers get together to build things in a constrained time period. For this hackathon, we had about 18 hours to work. Besides that, there were no limits on what we did. After a long night fueled by pizza, snacks and a few beers, the team presented our concept to a room of over 300 other hackers. With no sleep and battling complete exhaustion, everyone was given 90 seconds to present their concept. It was great seeing what the other teams had worked on. We were definitely in the company of some great minds. Overall, we had a great time building Flymodo and it was exciting to see our philosophy of prototyping and rapid development produce one of the most polished products in the competition. The next Disrupt conference has already been scheduled for September in San Francisco. You can bet the Kickstart Concepts team will be there! Copyright © 2017 - Kickstart Concepts, Inc.